Why do you wish to call him John?” they asked in surprised. “You have no relatives who are called by that name.” Then they turned to the old father, who had not spoken since the angel talked with him in the temple, and by making signs they asked him what they should call the child. “How strange!” thought the people. And all at once Zacharias began to speak to them again, just as he used to speak before he had seen the angel. And he praised God for giving him this wonderful baby boy. 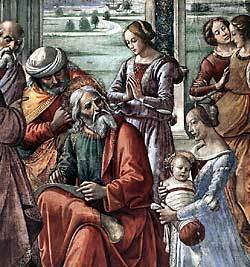 Perhaps Zacharias and Elizabeth did not live to see the day when John become a very useful man for God, for he did not begin his great work until he was thirty years old. Until that time he lived quietly in the desert country, and studied the books that God’s prophets had written. He also listened much to the voice of God, and learned to understand God’s will. This entry was posted in Discipleship and tagged Angel (TV series), Christianity, Elizabeth, God, Jesu, Jesus Christ, Jew, Lord, Old Testament, Religion & Spirituality, theology, Zacharias. Bookmark the permalink.